In a new series for our website we will provide readers with greater insights into some of South Africa's most well known regions. We start off with the most famous township in South Africa. SOWETO. SOWETO is an acronym for South Western Townships. This page will provide greater details regarding the demographics and size of Soweto, based on data collected by Statistics South Africa. They have a treasure trove of data and we feel it is not mined and used enough. And we would like to change this by showing readers just what kinds of information is available from the Statistics agency. According to Statistics South Africa there were 1,271,628 people living in SOWETO at the time of the last Census (2011). There were 355 351 households in SOWETO, 9.3% of residents aged over 20 years had a higher education, only 55% of SOWETO residents had piped water inside their dwelling, while around 93% had electricity of lighting, and around 91% had access to a flush toilet connected to a sewerage system. The image below provides a graphical representation of the data mentioned above. The racial breakdown of SOWETO, is as readers might expect, dominated by Black African population, as during the apartheid years, Black Africans were forced to live on the outer edges of cities, thus Black African's dominates the population profile of SOWETO. The image below shows the population groups as a percentage of the total population in SOWETO. Black Africans make up 98.5% of the population of SOWETO, with Coloureds making up 1%, Indian/Asian, Whites and other race groups making up a mere 0.4% of the total population of SOWETO. Males make up 49,6% of the population in SOWETO, while Females make up 50.4% of the population. The languages spoken in SOWETO is pretty diverse though. the table below shows the percentage of each language spoken in SOWETO. IsiZulu, being the most spoken language in SOWETO with 37.1% of citizens speaking it, and Sesotho being the second most spoken language spoken in SOWETO out of the 11 official languages in South Africa. No surprise that Afrikaans is not very high in this list as this is a language mostly spoken by coloureds and whites. Surprising though is small percentage of English being spoken. The next table will take a look at the Tenure status of households in SOWETO. Do households, own, rent, occupy for free etc. ​A large portion of households rent the dwellings they stay in (28.6%). And of that a large part of that is backyard shacks being rented by households. 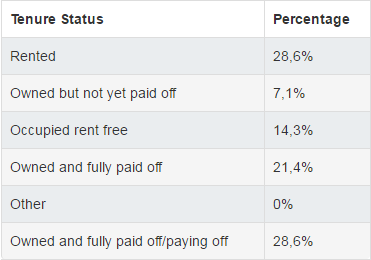 A large proportion of households reported they own and have fully paid off their dwelling (21.4%). A large part of these dwellings would be informal shacks or government provided housing for which limited payment was required or housing was supplied free of charge. Now that we know the tenure status of households in SOWETO, what type of goods to the average household in SOWETO own? The table below shows the percentage of households that owns various household items. SOWETO is known for being extremely close to very affluent areas, yet the majority of those living in SOWETO are extremely poor, and the graph below provides an indication of the percentage of SOWETO's population earning between various income groups. And as can be seen from the graphic a large proportion (roughly 19%) of SOWETO's population earns absolutely no income. And only 3% of SOWETO's total population earns more than R307 600 a year. This in stark contrast to a very wealthy area close to SOWETO, called Sandton. Our next district in detail will be Sandton, so that readers can draw the comparison between SOWETO and Sandton.